Zach Harless is pictured in this Times-Gazette file photo. Harless shot an 83 at Shawnee State Park on Wednesday to lead Whiteoak to a third place finish in the D III Sectional Golf Tournament. 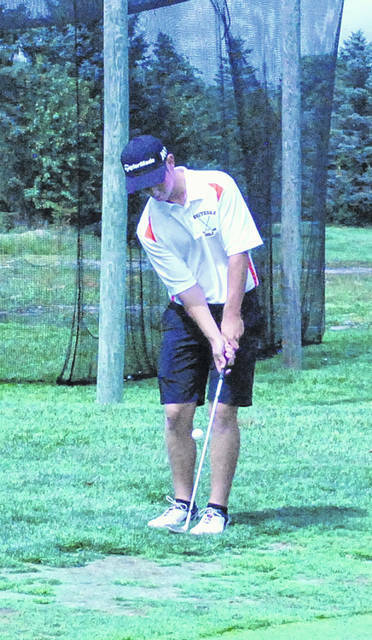 The Division III Southeast District Sectional boys golf tournaments were held on Wednesday at Shawnee State Park Golf Course in Friendship and at Jaycees Golf Course in Chillicothe. At Shawnee the Whiteoak Wildcats and Fairfield Lions competed with players from 14 different schools including fellow Southern Hills Athletic Conference members Manchester, West Union, North Adams and Peebles. The Wildcats continued their strong play on the links as the team combined to shoot 359 in the tournament to secure third place and a spot in the D III District Tournament at the Elks Country Club in McDermott on Monday, October 1. Whiteoak was led by Zach Harless who shot an 83 in the 18-hole tournament to take eighth place overall in the event. Other scorers for the Wildcats were Ty Large who finished with a 90, Ryan Roberts and Jacob Campbell each shot 93 and Clay Risner carded a 98. Fairfield shot a 409 in the tournament to finish in 10th place at Shawnee State Park on Wednesday. The Lions scorers were Bryson Simmons with a 99, Ryland Donley who shot 103, Wyatt Willey who finished with a 107, Bryce Posey who carded a 110 and Connor Priest shot 100 for the second lowest score on the team. Manchester and West Union were first and second respectively with team scores of 323for the Greyhounds and 326 for the Dragons. At Jaycees in Chillicothe the Lynchburg-Clay Mustangs claimed eighth place with a team score of 428. The Mustangs were led in scoring by Tyler Stevens and Braydon Eversole as each carded a 99 in the 18-hole tournament. Stevens earned the right to advance to the District Tournament on Monday as he earned the fourth qualifying position courtesy of a tiebreaker. Other scorers for Lynchburg-Clay were Jordan Wills and Damin Pierson with scores of 100 and 130 respectively. Listed below are team and individual scores for the SHAC golf teams in both events.